If you’ve stumbled upon this site and wonder what’s happening, the answer is that Leslie and Bridget are figuring out how to build and manage a wordpress site. Our vision for this site is that it be a permanent home for events (via our shared, embedded Google calendar) and documents to keep group information available for our loose, mycelial permaculture network. 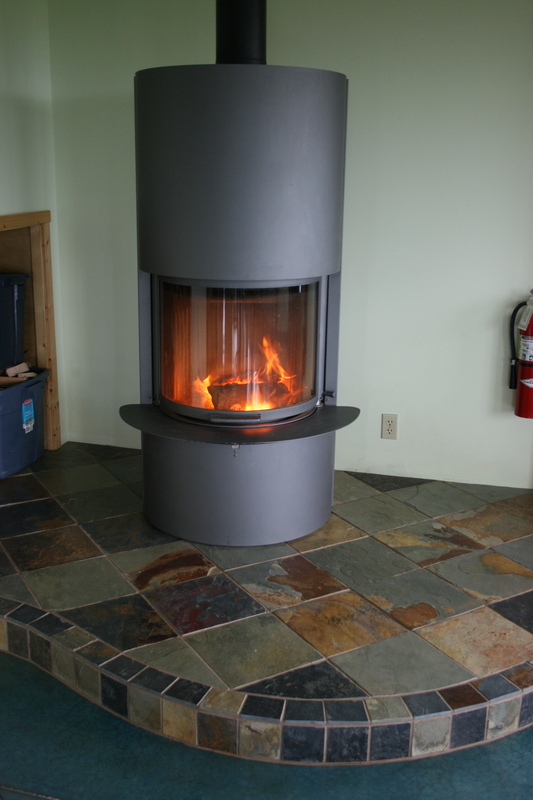 We hope that it will also be useful any visitors or newcomers to Anchorage, AK. 1. Council would be a smaller group of up to 6 self-nominated people that will meet 1st Sat of the month @ at the Loussac library to cover the business of figuring out activities for the larger group. We have 4 people now, and would welcome a couple of more souls. 2. Our idea was to create a monthly sequence of things like: Feast, Event, Movie, Skill, Speaker. We talked about meeting Sept/Oct/Nov. – take a break in Dec – Jan/Feb/Mar/Apr/May/June/Jul – take a break in Aug. Also meeting generAlly in more public locations. 3. Since the demise of the Ning site, We talked about creating a new website on WordPress, that would be linked to this FB. Michelle Wilber is working on that. 4. The main idea behind all this was to try to figure out a way to move the Guild forward, building on strengths, and giving some support to areas where we have struggled. We actually got together to discuss another matter, but the teaser behind the matter at hand had to do with the Guild. During the past year we have observed the Guild floundering as we discussed/ debated/ resisted discussing or debating things like our purpose, our goals, our structure, decision making, who and what we are or are not about. There are a number of things yet to figure out and put forth – we are willing to give it our best try. 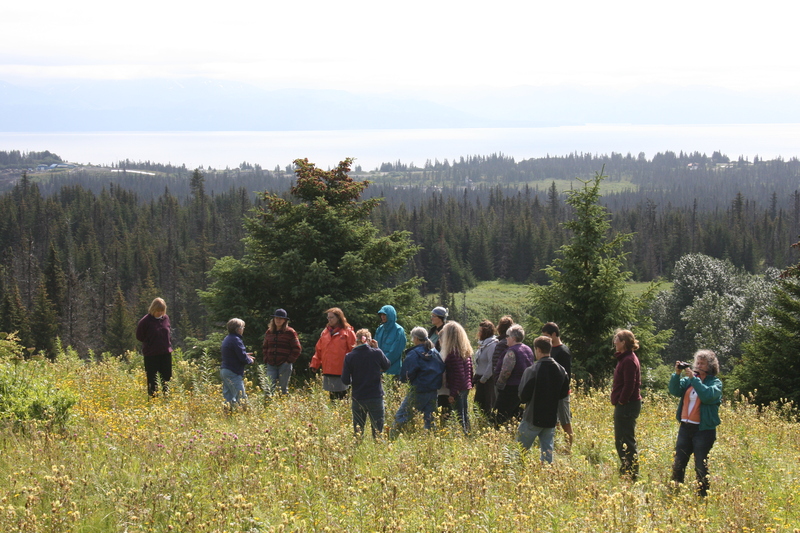 Red Edge Design is happy to announce Alaska’s second-ever Permaculture Design Course, happening April 23rd- May 5th, 2012 in Anchorage! This will be a full 72-hour certification course, covering all the required curriculum you need to become a Permaculture Designer, with special emphasis on home-scale and community-scale applications in the far north! We will focus on home-scale solutions because most of us here in Alaska are working with small lots as opposed to larger farm-scale operations. Home-scale solutions include growing food in the northern latitudes with limited space and time, greenhouses and other season-extension techniques, cold storage, rainwater harvesting, grey-water, small-scale renewables, and much more! We will address issues that affect our northern communities, such as our inefficient housing, car-centric city plan, and fragmented neighborhoods. In addition to learning how to utilize our community wastes to create abundant edible gardens and food forests, you will learn how to deal with bureaucracy, organize placemaking events in your neighborhood, and design a regenerative business. If you are interested in Transition Towns, in making our communities here in Alaska more livable, this is the Permaculture course for you! Registration is now open! Go to the registration page to sign up! 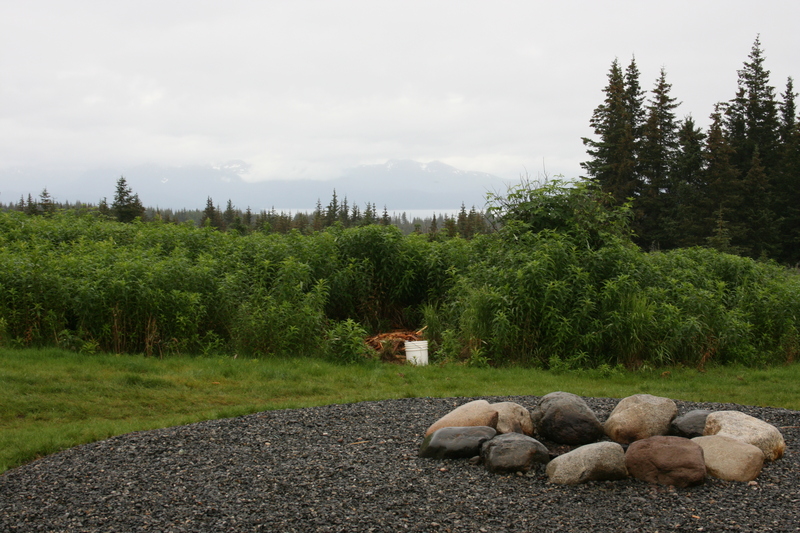 The view from the top of the hill is amazing, looking out onto Kachemak Bay and the mountains and glaciers beyond. But the wind constantly whips through, gaining speed as it rushes to get around the buildings. 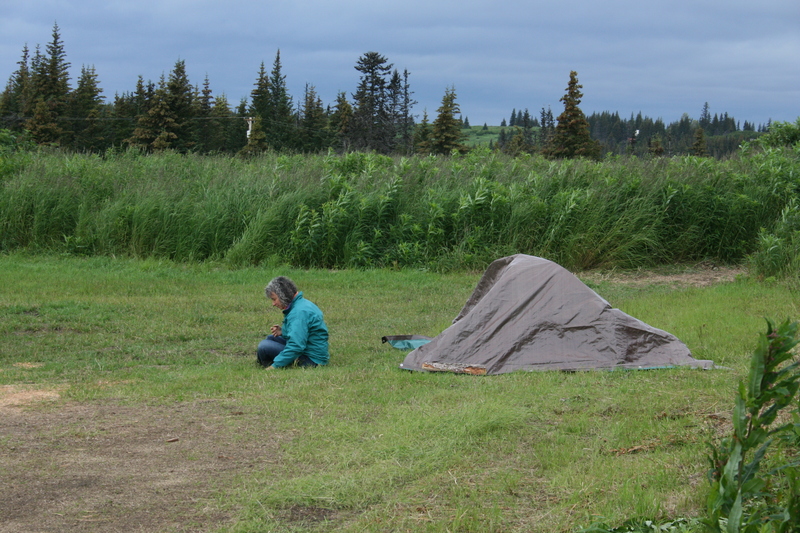 We were challenged to find a way to slow the wind as it approached, provide shelter for birds and small animals, privacy from the neighbors, and add beauty and diversity to the hill of fireweed. We learned that a windbreak that is 40% permeable is the most effective at slowing wind. A solid piece of wood or glass would merely cause the wind to gain speed as it moved over it and tumble to the ground in a spiral on the other side. Likewise, a windbreak that ramps up gradually rather than sending the wind straight up and over will cause less turbulence on the other side. We assembled outside with our shovels as Rick oriented us to the “nursery.” Saplings too close to the road or bushes on the trail that had been run over by the four-wheeler but refused to die. In 30 minutes our army of 24 collected a huge array of plants; alder, white spruce, birch, spirea, black currant, wild rose, and elder burst from the wheel barrow. 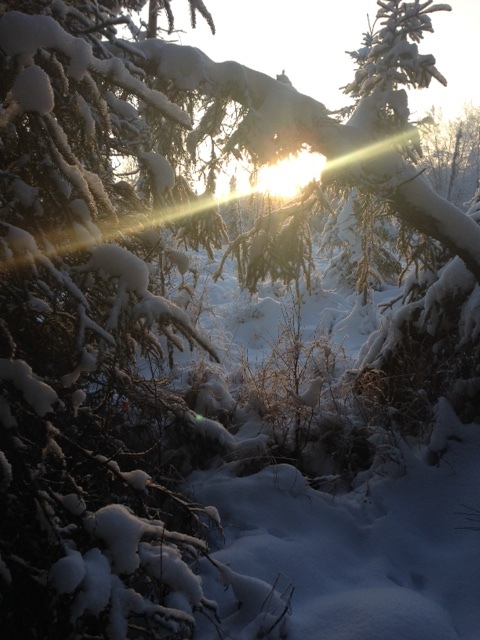 We stomped a path through the fireweed that would be our windbreak line, dug holes, planted, mulched with the fireweed we had to tear out, and protected the birch and alder from moose with spiny dead spruce branches. We brought in soil from the forest floor to inoculate our new trees with the proper microorganisms. Less than an hour later, the last tree was planted, and we gave our project back to nature to work the real magic. Was it sleeping in the grass? Was it eating something I’m not used to? I’m not sure, but I had a headache. I drank water. I took advil. I didn’t feel very well. And then we went to Nancy and Julia’s place. It’s a beautiful strawbale house and a way over-built greenhouse/gathering space with a field of wild plants and flowers out front that falls away into the valley. Nancy took us on a plant walk. The knowledge of the group rose up out of the mass of vegetation as we went. The first thing Nancy showed us was Wormwood and said it was good for headaches. They passed a couple leaves to me. I looked at it sideways and Terri figured it out and told me to wad it up in the side of my cheek like a wad of chew. Besides feeling like a squirrel, it kept my mind on something other than my headache. It didn’t hurt that the sun was shining, blue skies and a shimmering ocean in the background. Off in the distance both volcanoes stood out prominently on the horizon. We stomped down the hill making meandering river-like formations in the tall vegetation. We’d stop and try out some willow tops. Then some yarrow. 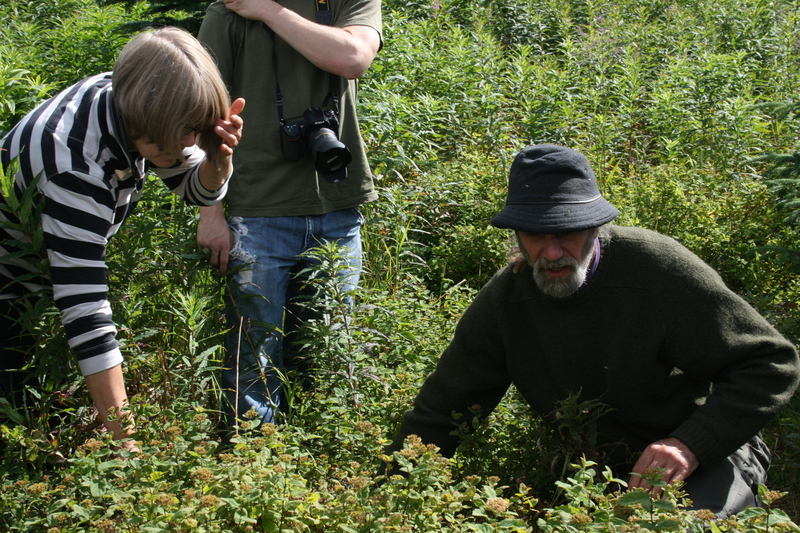 Every once in a while we’d all try a stinging nettle, or examine the invasive hawk weeds that look so pretty. We’d all talk at once about the philosophy of whether plants can be invasive or not. Then we’d move on to the spruce sprigs and cotton wood sprigs and listen/share all the stories about how we’ve used these. But when the poster came out, we all listened with care about the difference between angelica and a very deadly plant. The rhyme was vein to the tip: that’s hip. Vein to the cut, bad for the gut. But will I ever feel at home enough in the woods to really be confident? I hope so. We gathered greens for our salad and headed back to the straw bale house for burgers on the grill. We sat out until late basking in the sun and making deepening friendships. Another great day at Permaculture Camp. In Permaculture we use protracted and thoughtful observation rather than protracted and thoughtless action, so our second day we learned how to observe and read the landscape. 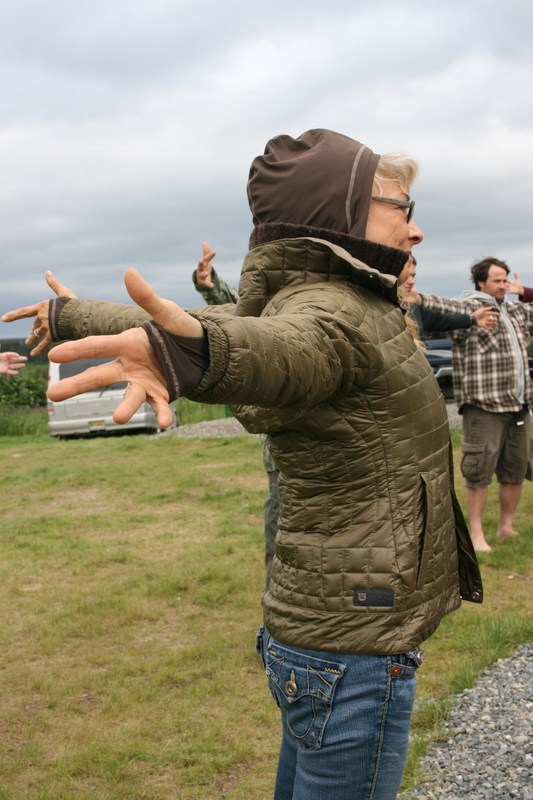 We practiced using all our senses; not just seeing what is around us, but feeling the wind on our skin, tasting the crisp air, smelling the blooming fireweed, and hearing the birds in the air. We practiced using our peripheral vision, which is less tuned into color, but more tuned into movement. I caught a tiny rabbit hopping away out of the corner of my eye. “If you’re not living on the edge, you’re taking up too much space.” was my favorite quote of the day. Beams transverse our meeting space, giving us a solid structure, but they visually enable us to have the courage to move beyond the edge—to stop looking at the problems of society, and say, “The problems are the solution.” It felt great to spew problems out one after the other, but then having to connect the problems and look for the patterns in order to see the solutions. So I am learning to love the problems themselves—which puts me right out there at the edge and it’s a little scary there. Creativity happens at the edge—where two ecosystems meet. If each of us here is an ecosystem, we certainly have a lot of creative juices as we meet and get to know each other. There is a diverse bunch of people, but connections are always made and commonalities found as we gather for those delightful organic meals. I’m imagining great creativity will be found as we start designing and using the strengths of these smart people around me. I set up my tent on the edge. Well, the edge of the yurt, that is. I decided I wanted to borrow from that housing system in case I needed to hang a tarp from their railing. After getting the tent up and the air mattress blown up, a small feat, I decided that that was all the creativity I could stand for the evening—besides it wasn’t raining anymore. So problem-solving, meeting people, and sleeping all on the edge means I’m not taking up too much space! But I may be having entirely too much fun—an extra yield. I’m off to start thinking about a whole new Permaculture Principle and how it will yield throughout this experience on the bluff over Homer. Registration has just started, and our first student here, Kathryn, is now out in the rain trying to find a place to pitch her tent. We have a fire burning in the community center and snacks out on the table. We spent the day unpacking food, setting up the classroom and visiting the field-trip sites. We got a great deal on 20 lbs of scallops, fresh off the boat, and the organizing crew taste-tested them for an early dinner. Like a gardener, anxiously waiting her precious tomato to fruit, we are waiting for the fruits of our efforts to begin. The seeds were planted two years ago, and patiently tended. There were times when we thought it might not happen, but we persevered. And now it begins… an opening circle, loud laughter, friends greeting and friends-to-be meeting. The excitement is tangible in the air. Every person in the room has made a serious commitment to be here. Passed kids off, found pet sitters, left their garden in the height of harvest, took time out from their jobs, and found the money to pay for it. We are all in this together and are ready and open for what will come in the next two weeks. 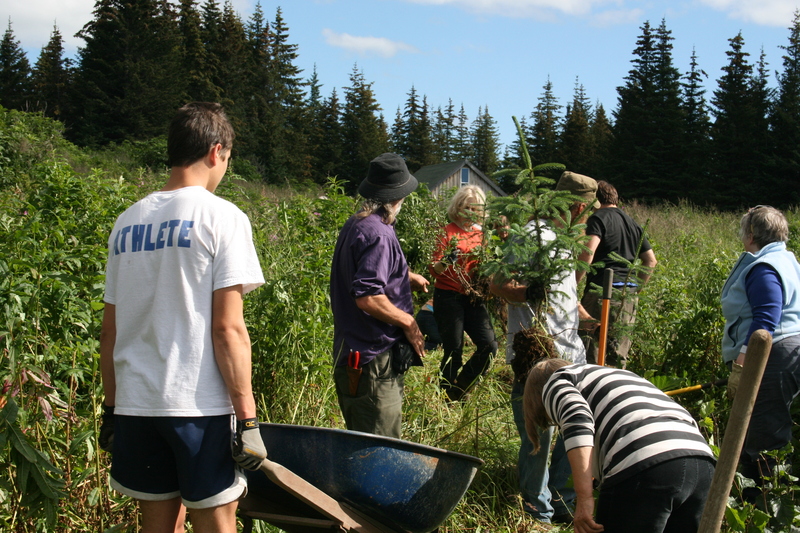 Our mission is to provide opportunities for people to meet, share knowledge, build skills, relationships and foster a community of practice for permaculture in south-central Alaska. Permaculture is a problem-solving approach. The problem we are trying to solve with permaculture is how to live well on the planet while maintaining and improving our ecosystems.